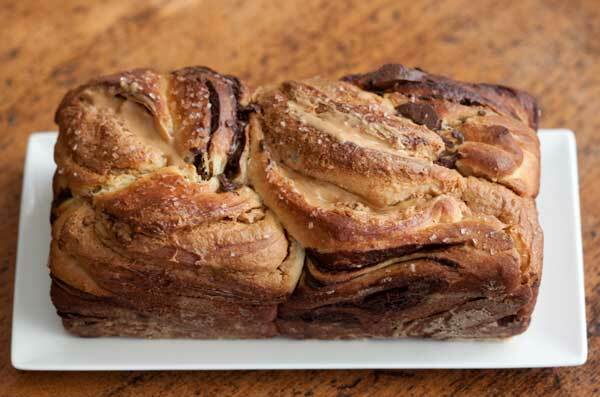 Chocolate Peanut Butter Babka is a butter and egg rich European bread filled with chocolate and peanut butter. Before you start, make sure you have some space in your freezer or refrigerator fo chilling the dough. Combine the flour, sugar, yeast and salt in the bowl of a stand mixer with the paddle attached. Add milk and stir until well mixed, then add the egg, yolk, and continue mixing until blended. Add the butter a few chunks at a time and continue mixing, scraping down sides of bowl with a scraper. Switch to the dough hook knead for about 5 minutes. Stop the kneading occasionally and push dough off the side of the bowl and into the center with a scraper. It will be a very sticky dough, but kneading it should give it some elasticity. Don't expect it to fully leave the sides of the bowl as it's kneaded. Scrape the dough into a bowl that has been greased with oil and roll the dough around so that it’s slick. Cover with plastic wrap and let rise in a warm place until doubled in bulk (about 40 minutes to an hour with the fast rising yeast). When dough has almost finished rising, prepare the filling mixtures. Mix together the peanut butter, butter and sugar and set aside. Melt the chocolate chips and butter together in the microwave using 50% power and stirring every 30 seconds. Stir in the sugar. Dust a work surface with flour. Pat the dough into a 9x16 inch rectangle. You might want to lay a sheet of parchment over it and roll it a bit with a rolling pin, but it should be slick and fairly easy to work with. I usually just pat it down with my fingers. Spread melted chocolate mixture over half and peanut butter mixture over the second. Score the rectangle vertically down the center so that you have two sections that are 9 inches tall and 8 inches wide. Starting at the bottom, roll each piece into a tight jelly roll so that you have two jelly roll/cylinders each about 8 inches in length. Transfer to a parchment lined baking tray or something that will fit in the freezer and freeze for about 20 minutes to set the chocolate. Thoroughly grease an 8 ½ by 4 ½ inch or a 9x5 inch loaf pan, line lengthwise with a strip of parchment paper and dust sides with flour. Take one strand of the split chocolate and one strand of the split peanut butter. Twist one over the other the best you can (the chocolate twist might be a bit stiff from the freezer) and lay your stubby little twist cross-wise in the loaf pan. Repeat with remaining split dough strands. In the end you should have a loaf pan with four stubby little twists sitting side-by-side going across the whole pan. Push them together gently, but don't worry too much because they'll all mesh together when they rise and bake. Let the loaf rise for an hour. If desired, mix together a little egg and milk and brush tops of loaves with egg mixture. Sprinkle with a little coarse sugar if desired. Bake in a preheated 350 oven for about 45 minutes or until a thermometer inserted reads 205 degrees F.
Let cool in the pan, then very carefully remove, using parchment paper as a lift. Let cool completely, then wrap in plastic wrap and freeze until ready to use. I find the loaf easier to deal with after it's been cooled, frozen and thawed. **If you double the recipe, use 2 eggs and 1 yolk. There's no need to double the yolk. ** For the chocolate filling I've found that Ghirardelli Bittersweet chips mixed with sugar and butter work nicely and the chocolate doesn't seep/thin out as when I use a chopped bar. But bars work too. For the loaf size I've successfully used an 8 1/2 by 4 1/2 inch pan and a 9x5 inch.